with original photographs, video and sound clips, album reviews, and links. 25 video clips available covering all the main aspects of this site. 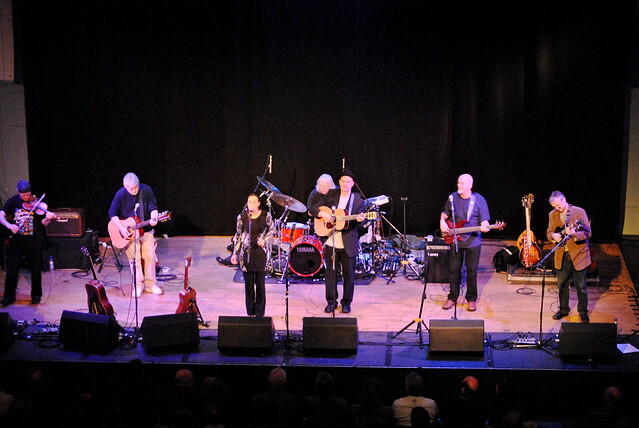 Fairport Convention in Edinburgh, 2010.
by The Queen's Hall, on Flickr. - also includes Morris On and its descendants. - includes The English Country Dance Band, Token Women, Rod Stradling, Jo Freya. New album "The Antiquated and the Arcane" was released 1st November 2010! Original pictures and descriptions of morris sides. Links. Chiltern Hundreds band. Picture taken at Wimborne Festival, 2005. Three different video clips available of this performance. See their entry on the morris pages of this site. Folk festivals in the South and South West and links to other related sites. Photos, sound clips and videos of local performers. Suggested searches: Performers, bands and their members, albums, album tracks, morris sides, folk festivals in the South. Throughout these pages these icons indicate links to pictures or sound. When they appear, click the icon. Pictures. Mostly original photographs by the author of this site. Please enquire if you wish to use copies of these, or if you require a large, high quality version. Sound clip. Indicates a short MP3 sound clip. Typical playing times are 1 minute. Note that these are all original recordings by the author and traditional compositions, hence do not break any copyright. The sound quality does not represent that on artists' own C.Ds. General MIDI file. Small file sizes hence quick download. Video clips illustrating all the main parts of this site have been added to external media hosting sites. There are now 25 video clips organized to be seen in context of the relevant pages of this site. Broadband and Flash player are needed for most videos, but there are a few tiny videos available for immediate viewing without special software, and available to those visitors, worldwide, with a dial-up or other slow internet connection. When this icon appears, follow the link indicated. and even... maybe not music! This zone does contain information on more English music, more instrumental music, and more traditional music! Links to other sites on traditional English folk music. EFDSS The English Folk Dance and Song Society. Folk and Roots The online guide to the Folk, Roots and Acoustic Scene around the UK, providing information on events, festivals, workshops, venues, reviews and artists. Includes a festival list of the UK, organized in order of date throughout the year. Music Traditions An online magazine web site by Rod Stradling. fRoots The web site for fRoots, a printed magazine. Webfeet An excellent site for folk dance. Many links. Halsway Manor National centre for traditional folk music. The Living Tradition Folk music of the British Isles. Traditionalmusic.co.uk A huge collection of folk tunes of the British Isles and America in the form of MIDI files which can be listened to immediately, together with sheet music. Links. English Folk and Traditional Music by Martin Nail. Loads of information and many links. English Ceilidh News and discussion list. Folk Icons - The official home pages of many English folk artists. The Bee's Knees - "A music information archive" featuring many English folk artists. A selection of record companies who specialize in English folk music. Topic Records.A long established company from the days of vinyl and still going strong. Saydisc. A record label who produce specialist music far from the commercial. Park Records. The label of Maddy Prior, Steeleye Span and others. Veteran. Specialise in English folk music including historic early recordings. Also supply CDs from other labels. Free Reed Records and Music. Free Reed is the label of the Old Swan Band's early work. Talking Elephant (formerly HTD). They have a range of material from Fairport Convention, Ashley Hutchings and related artists. Chudleigh Roots. Phil Beer's record label. A site about folk music from the musician's point of view with an emphasis on traditional instrumental dance music. Sources of traditional tunes, the playing of instruments and some aspects of music theory. The English Music title text and flag logo are copyright S. J. Farthing, 2002. The author acknowledges that some other images on this site are the copyright of others and will remove them if requested by the copyright owner.